Can you confirm these amateur observations of Crenadactylus ocellatus? Type locality: restricted to Champion Bay, Houtman’s Abrolhos, West-Australia (fide GÜNTHER 1875). bilineatus: Terra typica restricta: Champion Bay, Houtman’s Abrolhos, West-Australia (fide GÜNTHER 1875). maxillary teeth; 33–37 mandibular teeth; cloacal bones present in males (Dixon & Kluge 1964, Doughy et al. 2016). Diagnosis. 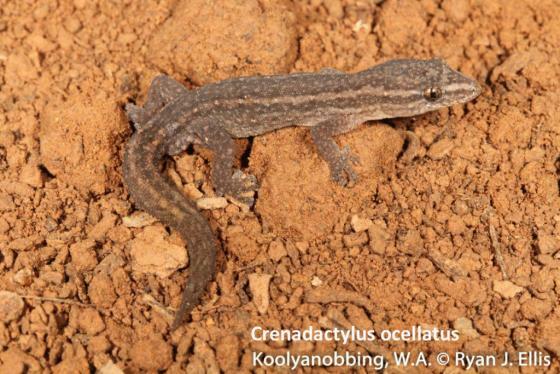 A moderately large (to 35.5 mm SVL) species of Crenadactylus with wide head (HW/HL 0.52– 0.70) and short trunk length (ILL/SVL 0.37–0.50). Rostral in full contact with nostril, internasal (if present) not extending beyond supranasal, 1 or 2 granular postmentals, dorsal scales homogeneous with smooth to weak keels, usually no pre-cloacal pores visible but some males with 2, when present pore-bearing scales in contact at midline, no enlarged tubercles on original tails. Ground colour tan and dark brown; dorsal pattern comprised of poorly- defined longitudinal pale and dark stripes, lateral zones pale with irregular dark stippling, pattern heavily overlain with intermixed pale and dark scales giving an irregular appearance, pale spots or ocelli comprised of 3–6 pale scales usually present in dorsolateral zone (Doughty et al. 2016). Comment Synonymy: Günther (1867) synonomized D. bilineatus with D. ocellatus, a move that was also followed by Boulenger (1885) and Doughty et al. 2016. Subspecies: the previous subspecies naso and rostralis have been elevated to full species status by Doughty et al. 2016. Type species: Diplodactylus ocellatus GRAY 1845 is the type species of the genus Crenadactylus DIXON & KLUGE 1964: 174. Distribution: See map in Doughty et al. 2016: Fig. 2. Habitat. Found in open woodland habitats throughout its range including areas dominated by Xanthorrhea grass trees, Eucalyptus (jarrah, mallee, marri, tuart, wandoo) and spinifex grass (Triodia) on a wide variety of soft (sandy and loamy) and hard stony substrates (e.g. laterite). Collectors’ notes record specimens have been found under ground cover such as fallen and rotten logs, woodpiles, leaf litter, granite boulders, limestone slabs, sheets of tin, railway sleepers and rubbish. One specimen (WAM R72276) was found one meter high under the bark of a gimlet tree, and other records mention ‘under bark’ indicating some climbing ability (Doughty et al. 2016). Etymology A combination of the Latin word crena meaning ‘notch’ and Greek word daktylos meaning ‘finger’ in reference to the forked terminal phalanges. The specific name ocellatus refers to the pale scattered blotches or ‘ocelli’ on the dorsum.